The Arcam FMJ range is Arcam’s ultimate audio performance in home cinema and stereo systems. All of the FMJ range is manufactured in a black finish of which all modules seamlessly blend together to great a cohesive modern look. The FMJ range features 4 integrated amplifiers, 2 power amplifiers, 1 pre-amplifier, 1 stereo AV receiver, 3 multi-channel AV receivers a CD player and a Blu-ray player. The ‘FMJ’ acronym stands for Faithful Musical Joy. In this review we will be looking mostly into one of the integrated amplifiers, the FMJ A39. Technology in the FMJ Range. The main technology in the FMJ range is the fact they use Arcam’s highly developed Class G amplifier technology. 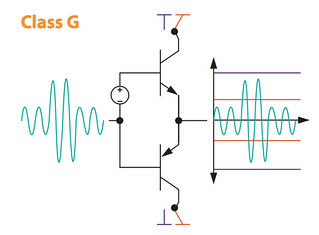 Unlike the older Class A and AB amplifier designs, Class G is a very highly efficient design which allows for the amplifier to dynamically switch the power supply rails going to the output stage of the amplifier. This allows the amplifier to use less power and be more efficient in the lower volumes compared to Class A which every output stage is constantly on at full power, this is why Class A amplifiers run very hot and consume a lot of power. Class G borrows some ideas from Class AB by having a pair of output stages, one output stage to do the upper part of the sound wave being produced and another do to the lower part of the sound wave. This allows for a more powerful and efficient design while keeping heat to a lower level than Class A. 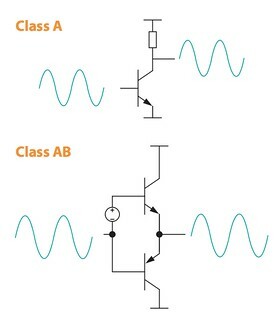 Class G builds on Class AB by having two individual power supplies which can switch over to each one as and when it needs to be switched. Class G sadly though is very hard to engineer and get right, which is why its hardly used within the HIFI industry, however Arcam has spent many years in perfecting the design of Class G and has created many excellent sounding amplifiers from it. The design of Arcam’s Class G allows the first power supply of lower power to operate in pure Class A, which has little distortion. However, when the going gets tough the Arcam amplifiers switch to the secondary power supply to give the grunt to songs when the power is truly needed. With the ever changing technology within the electronics industry output stages for amplifiers have gotten very fast at being able to switch currents, which means that now the switching of the power supplies can be done on the fly without you even noticing that its constantly switching between the two power supplies. Three of the FMJ range’s integrated amplifiers use Arcam’s Class G technology, the A29, A39 and the A49 likewise the larger power amplifiers, the P349 and P49 also use Class G. Two of the AV receivers use Class G technology, the stereo SR250 and the highest end AV receiver the AVR850. As an added bonus to the higher end A39, A49, P49 and P349 they all have the Class A switching mode with 20W in Class A on the A39, 50W on the A49 and also the P49 & P349. How Does the A39 Sound? The Arcam FMJ A39 is a great amplifier for the price, it has dynamics and the power to drive most loudspeakers with relative ease. Its compact, smart looking and has many great features which make an all around ideal integrated amp for someone on a smaller budget but still wanting great performance. The A39’s bonus Class A side really shows in the lower volumes, giving great detail and imaging. Turn the A39 up and it still manages to keep up, even with the likes of something large and power hungry like the KEF Reference 5. Using the A39 on the KEF Reference 5 is a joy, songs like Michael Jacksons Human Nature (DSD) which really shows up the huge spatial sound created by the A39 powering the Reference 5 this special sound also comes along with crisp highs, amazing separation and huge amounts of detail. Another Song like Night by Benga & Coki really shows just how deep and powerful the A39 can deliver the bass its also speedy and impactful creating a great listening experience. Up next is partnering the A39 with the KEF Reference 1, of course it sounds mostly like the Reference 5, just not as much bass since it’s a stand mount and has 6 less bass drivers compared to the Reference 5. However, the A39 still shows control and great agility on a smaller speaker which has more stress since it can’t handle as much power as the Reference 5’s can. The A39 shows up great details in the vocals while still holding on to the subtlety even at louder levels on songs like Gregory Porter’s Holding On. Unfortunately, though since the Reference 1 is the hardest of KEF’s Reference range to drive its sadly not quite enough for the Reference 1 and you can start to hear the harshness from the amplifier not being able to keep up at the very high volume levels, however this is not noticeable with the Reference 5’s. Finally, we will be partnering up the A39 with one of the best Focal loudspeakers on the market, the Sopra No.2. Songs like Count Basie’s Bluesville you really hear everything from the recording, especially the layering from the orchestra and the trumpet in this track on that Beryllium tweeter is simply outstanding! Extremely crisp with no decay at all. The A39 also shows off what Focal is famous for – dynamics, the crescendos in songs like this really show how the A39 can do subtlety and instantly go loud effortlessly. The A39 provides excellent power into the bass drivers of the No.2s allowing them to truly hit their 28Hz point with great power and control. Controlling Focal bass drivers is no easy feat since they move so violently compared to other brands, so Arcam has done well here to keep them in check. The A39’s headphone output is also very good added bonus, it can drive Audeze LCD-3s fairly easily giving them the power the require to give solid bass and great sharp mid-highs and clear and clean vocals. The A39 also has 9 inputs this compared to the competitors is a lot given the price of the amplifier, even more so that this has the addition of a MM phono pre-amp. One of the inputs is a handy 3.5mm jack on the front of the amplifier providing easy and quick access to plugging a phone in or any other device without having to fiddle around the back of the amplifier. To conclude, the Arcam FMJ A39 is a great amplifier which can keep up with many much higher priced loudspeakers with little effort. It’s size allows it to fit into smaller rooms and shelves which larger amplifiers cant fit into. It also has lots of inputs which allow you to plug whatever you want into it. The Class A mode of the A39 is a joy to listen to in the lower volume ranges it provides all the bonuses of Class A but with greater efficiency. It also allows you to go into the “party mode” very easily and provide huge amounts of power into the speakers as and when its needed in a song. This means that the A39 provides great power and huge dynamics into what ever loudspeaker you plug the A39 into. The A39 shows great imaging with the KEF’s along with amazing details and an amazing impactful bass response giving you that lovely kick. Using the Sopra No.2’s with the A39 shows just how controlling the amplifier is while still giving huge amounts of power into the drivers of the speaker. Mac/PC with JRiver Media Centre 22. Ven Den Hul The Magnum Hybrid Speaker Cables. Audioquest King Cobra RCA Interconnects. Nordost Blue Heaven Power Cable. Am I correct to say no Arcam amp can power an Arcam rDac? (6v vs 12v component). Was hoping to have one less cable / plug on my extension block. Many thanks, Simon.